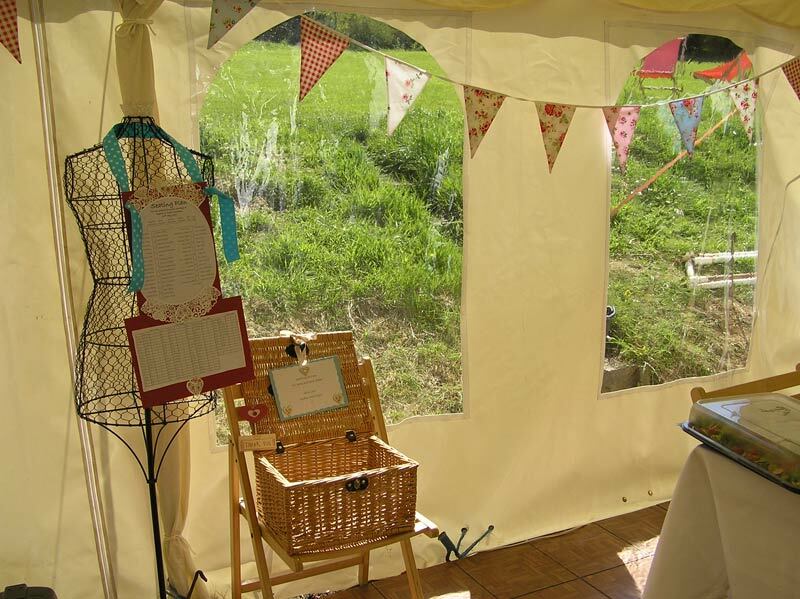 We don’t just do marquees for festivals! 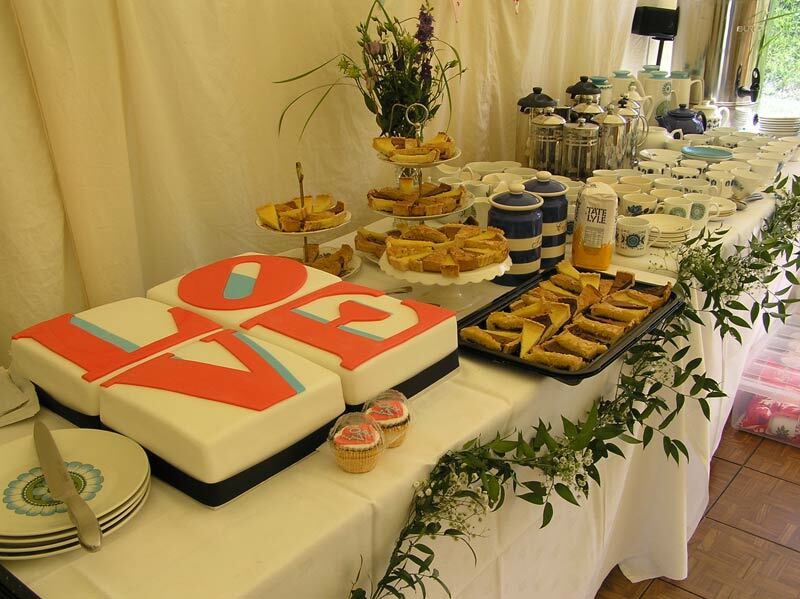 For weddings we can provide anything from a small tent, through to a beautiful marquee package for 200 guests with flooring, furniture, sumptuous interiors, lighting, power and toilets. 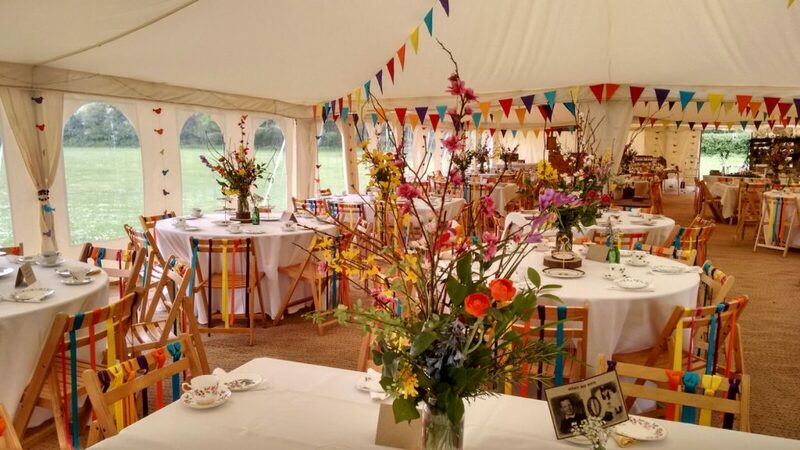 We pride ourselves on being a little different, so we offer a unique range of marquees, including our Circus or Festival tent for themed or festival wedding style events. 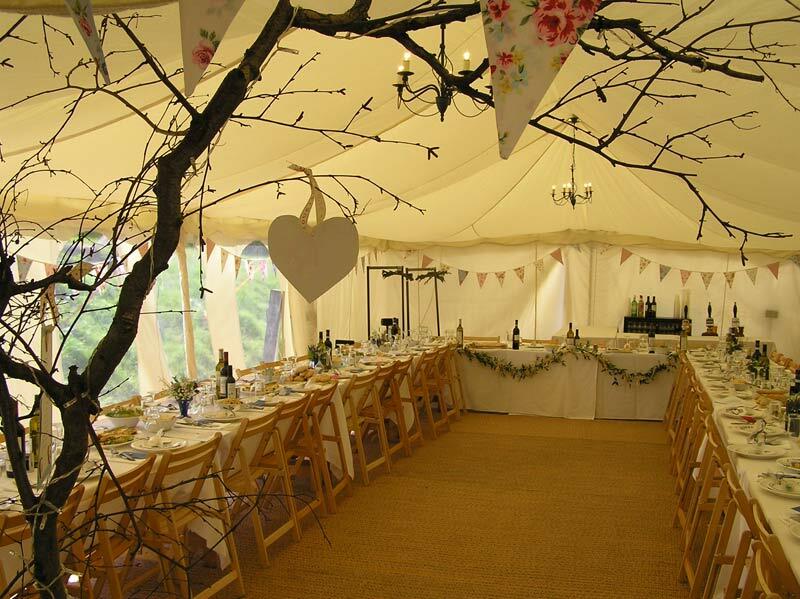 Most commonly we provide our modular frame tents, lined with lovely earthy, flat ivory linings, or elegant pleated ivory for a more classic look. 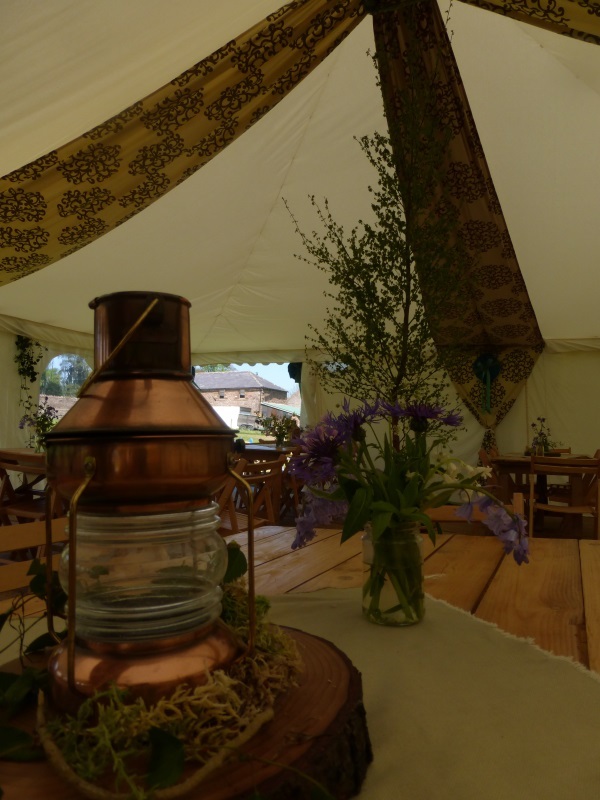 We can help tailor your design by adding fairy lights, patterned drapes, bunting, Moroccan lighting, flags, or fire bowls, alongside catering or reception tents, bars, dance floor, chill out spaces or staging and PA. As a small company, we feel we offer a personal service that others may struggle to match. 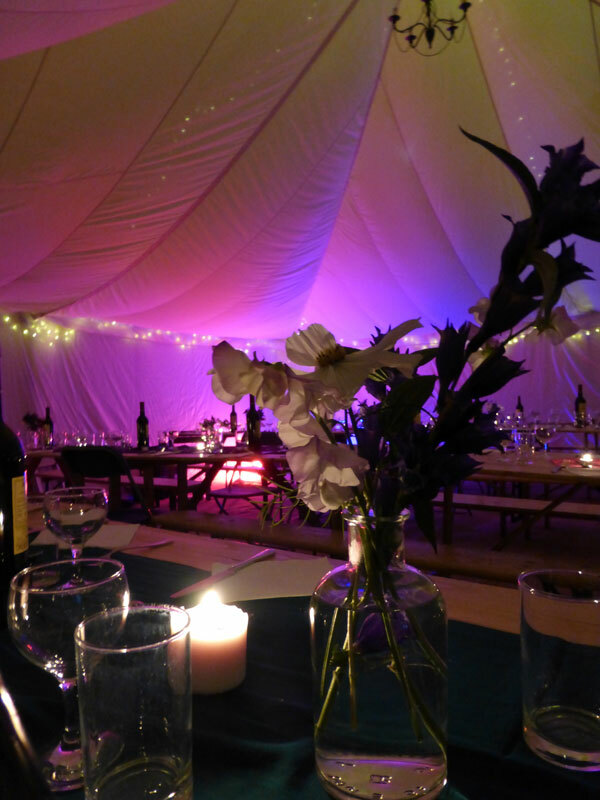 20x60ft (6x18m) modular frame tent, fully lined with flat ivory fabric, decorated with bunting, and lit by chandeliers, candles and 10 LED colour changing uplighters. 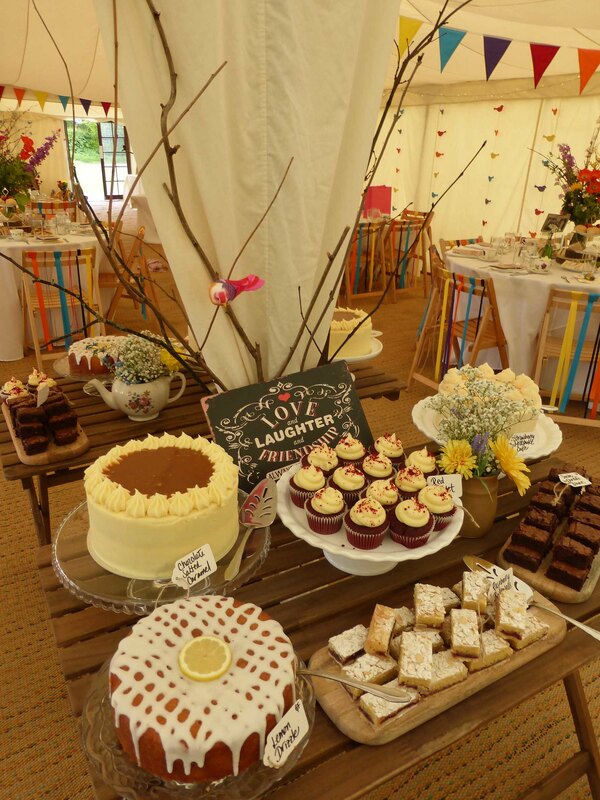 With wooden folding chairs for 80 at our rustic trestle tables, and 3 extra tables are provided for the buffet, drinks or DJ equipment. Fully floored, with matting on top of a solid subfloor, and the last third of tent a raised timber 20x20ft dancefloor, with white ‘moonflower’ disco lights either side. 1000w PA system with a pair of stand mounted speakers, amp and cabling. 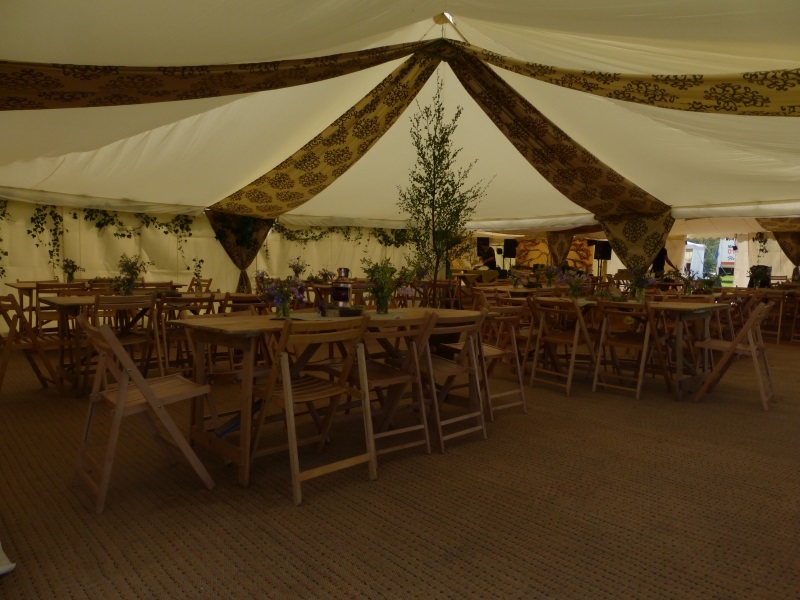 Our most popular wedding package, easily seating 120 guests at trestle or round tables, this setup uses two of our impressive 30ft wide tents with their high, vaulted roofs, perfect for decorating with gorgeous patterned drapes. 30x60ft (9x18m) modular frame tent, fully lined with either flat ivory with our unique patterned roof and wall drapes, or in pleated ivory, with a hidden starlight effect, provided by multiple strings of fairy lights behind the roof linings, which can be turned on during the evening for a special effect. Floor matting throughout, with a 15x18ft parquet dance floor at one end. Lighting by chandeliers and 12 LED uplighters complete with controller. 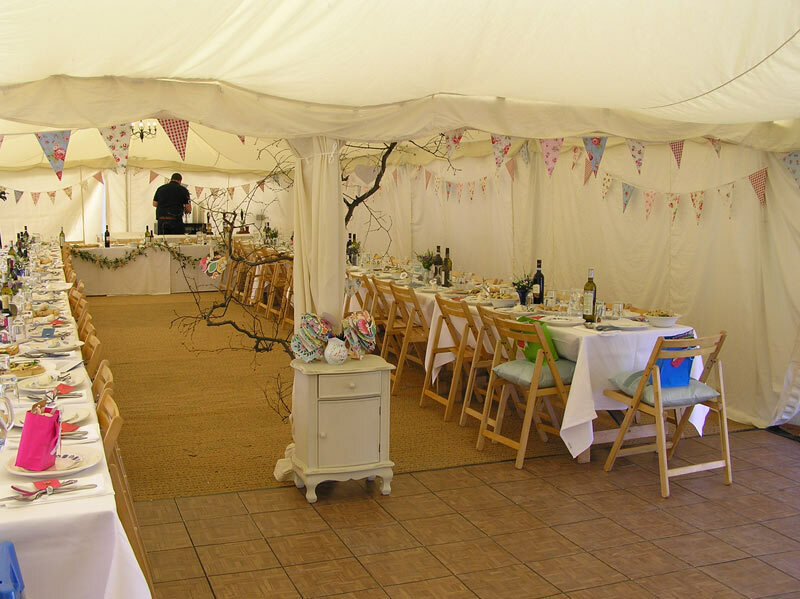 120 wooden folding chairs at lovely varnished trestle tables, 4 tables for buffet, drinks, presents, DJ etc, and a 15x20ft catering tent with flooring, lighting and power points completes a pretty comprehensive and great value package. Specialist lighting,staging, PA systems, heating, power and toilets are all available by request. 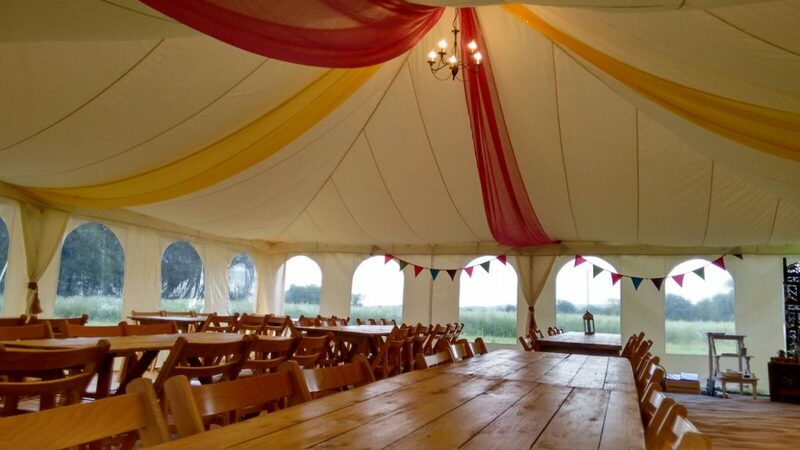 Perfect for a festival style wedding, or a large party, this package allows plenty of space for a sizeable stage, PA, dancefloor and reception area. Lighting provided by 12 LED uplighters with controller, fairylights fanning out from the central poles, covering the seating and eating areas, plus two lighting stands with stage lighting. Contact us for pricing for flag poles with festival style flags and poles and /or site festoon lighting. Generators and toilets are also available by request.